laketrout, the other thing I would consider putting in the recipe is some electrolyte/vitamin granules (you find them in the horse supply section in small foil envelopes). In reading around on the topic of how sugar syrup feeding compares to honey feeding or nectar feeding, the general thought seems to be that honey and nectar are better food for bees due to their micronutrient profile, although research to clear up just what micronutrients are involved is ongoing. It may be the placebo effect (irrelevant things that make the beekeeper feel better), but I like adding a small pinch of the electrolyte/vitamin granules. I made the sugar blocks according to the recipe minus the essential oils. I did not add those because I wasn't sure how much. I was afraid I would add to much or not enough to have any impact. I am also not sure which essential oils to use. There are so many different opinions it makes my head spin. Maybe I am overthinking the essential oils. I expected my bees to bee all over the sugar blocks and when I checked today the only thing in there was a yellow jacket. The good news is the bees are still flying. Here is the consumption rate for that sugar block-set 10-27-14. Usually a colony like this (With decent stores) will consume a block this size over the course of 60-80 days. I generally put blocks on twice in the course of the winter. I got 8 blocks this size from a full batch of my block recipe..using 25# of sugar, one quart cider vinegar and other nutrients. Although they would probably still take up syrup, I am doing this as an experiment to see how well the blocks work in extreme conditions. They WILL take up the block even when outside temps are very cold. Last edited by Lauri; 11-09-2014 at 02:54 PM. I made some bee cakes using the recipe. I used a 4# bag of sugar and 1/3 cup of apple cider vinegar. I dried for about 1.5 hours in oven at 170°. I did not add any chemicals, bee heroin, or additives. The cakes came out like bricks. What you see are bits of a large cardboard tube cut off which I pounded the mixture into with a rubber mallet. I have no room to put these under my inner cover so I made a "spacer" to put on top of the top super to hold the sugar. I drilled a few 7/16" holes in the sides to allow ventilation. Can someone tell me how many holes are recommended? Too little and no ventilation, too many, and too cold, right? Last edited by DrewInToledo; 11-12-2014 at 07:12 AM. I made some bee cakes using the recipe. 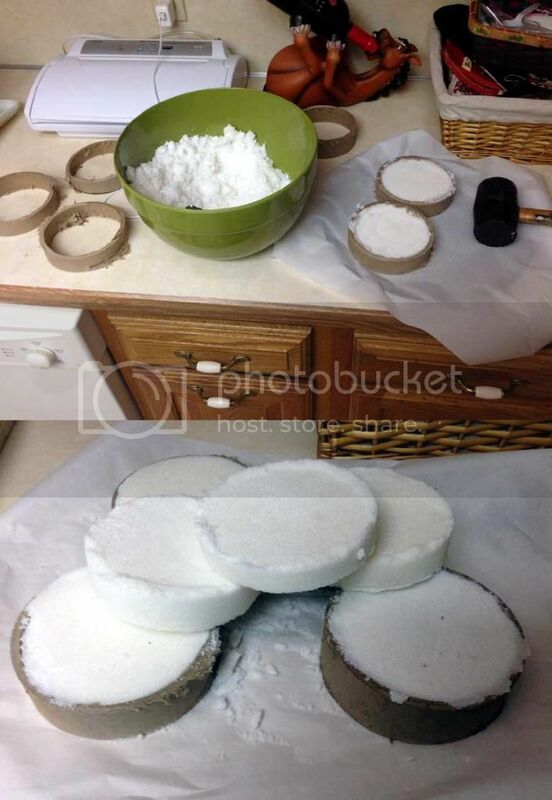 I used a 4# bag of sugar and 1/3 cup of apple cider vinegar. I dried for about 1.5 hours in oven at 170°. I did not add any chemicals, be heroin, or additives. I don't think you need to put holes in the spacer. Just put your regular inner cover and the TTC. How did you cut the tube with the sugar in it. If you used your chop saw would it ruin the blade? I cut the tubes first to create the forms to pound the sugar into. You'll see the empty forms on the left of the top photo. The blade didn't have a problem cutting the cardboard. The diameter is too large for a single pass, so I had to stop, rotate, cut, repeat. I estimate the tube diameter around 9". Think you will have excessive ventilation going on. Personally, I have a single 3/4 round hole in front side of spacer/feeder and then install my inner cover with notch up. Ventilation is air entering 3/8 x 1 bottom entrance and exhausting through 3/4 hole and notch. My belief is that 3/4 hole and notch will provide back up ventialtin should bottom get blocked by dead bees or snow. I also have a quilt box above inner cover. Here's a pic I took yesterday. It's abnormally cold for this time of year at 4F this morning. Zone 3b. If you always do what you always did, you'll always get what you always got! Lauri - Just wanted to let you know that I used your recipe for the sugar blocks. Whipped up 50# over the last couple days. I used the Kitchen Aid Mixer to do my dirty work. lol. Got a great consistent product though. Used the oven and pans that were 1" deep. Set the oven at 170 deg and it takes about 2 hours to completely dehydrate. Put them on the hives yesterday and watched the bees come straight to them. Going to take a peek each week and see how they are doing with them. Thanks for sharing your recipe! BTW... How's that colony doing with NO stores doing with these now? I would not drill holes in the spacer, and I would consider the use of a quilt box above the spacer. I make my quilt boxes out of empty supers, mediums are fine. I staple a burlap or screen floor onto the super, drill one or two vent holes in the upper ends, and screen the vent holes. Then I fill the box with white wood chips ie. guinea pig bedding. This box goes over the screened inner cover and under the wood inner cover (you don't really need that wood inner cover, but on top of the quilt box and under the outer cover is a good place to store it!). 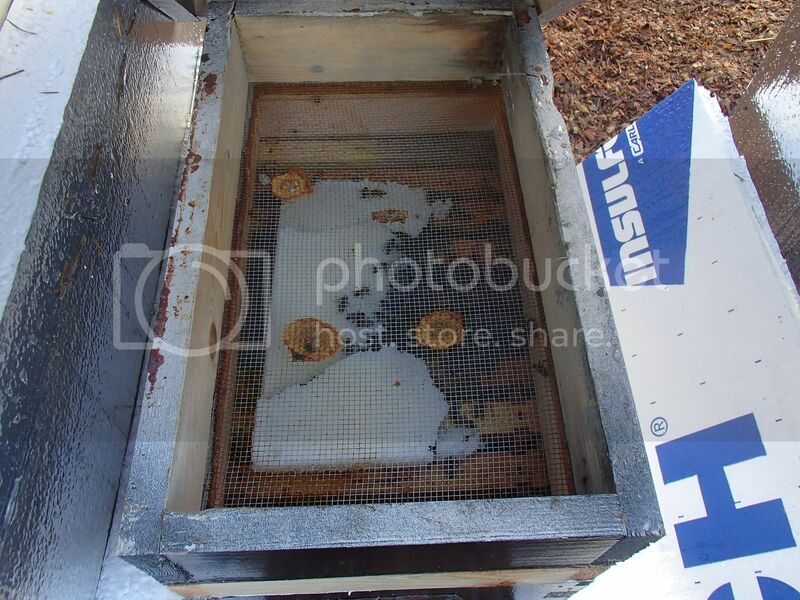 The quilt box lifts off easily if you have a screened inner cover under it as the bees cannot reach the seam to propolize. 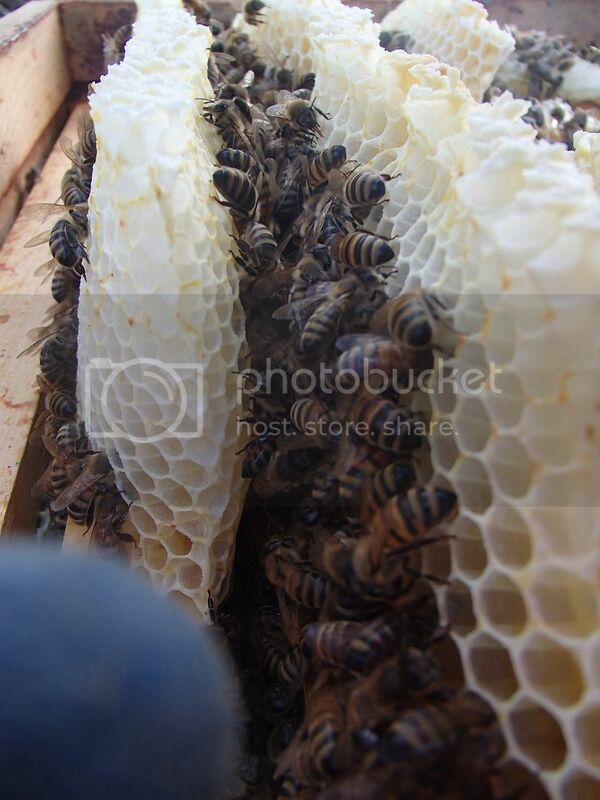 You can take a quick easy peek to see how the bees are working the sugar brick/fondant. How's that colony doing with NO stores doing with these now? 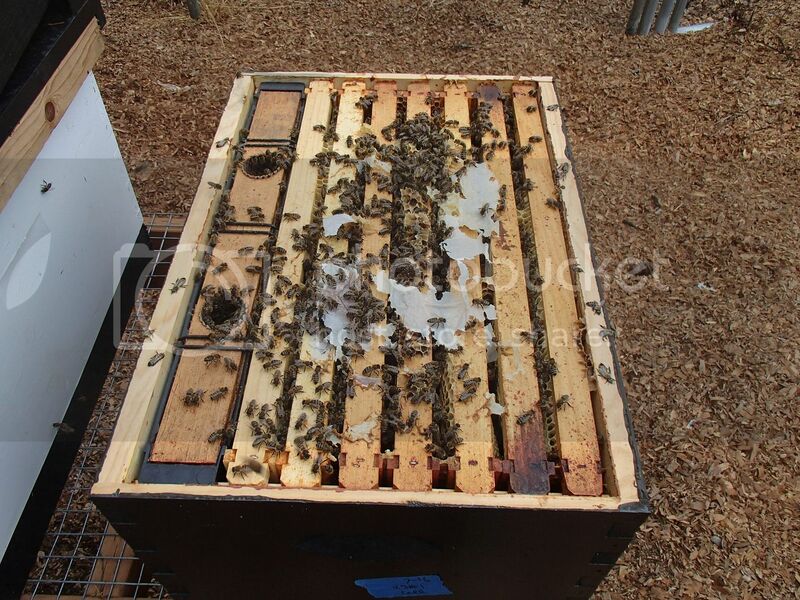 Photo above shows that mating nuc with the sugar block getting a sprinkle of dry beepro. 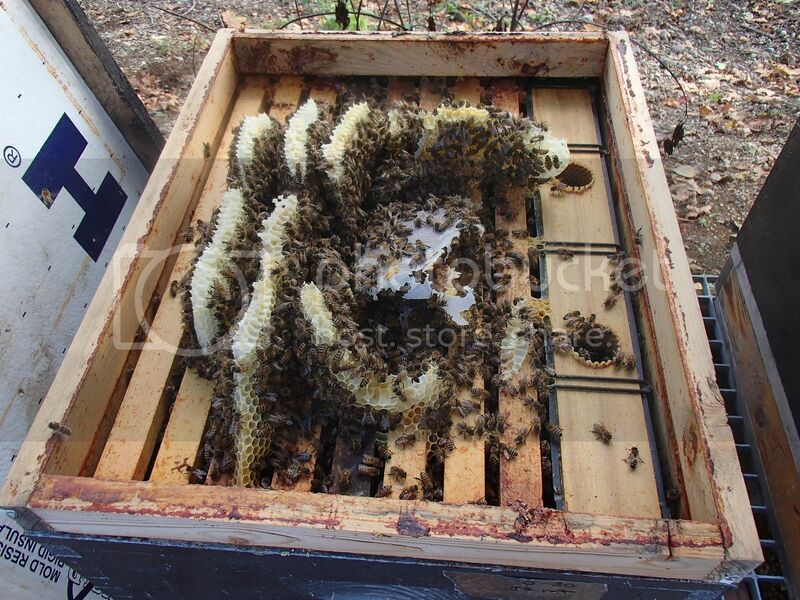 Some of it filters down onto the bees, but they groom, store and tidy up quickly. Although it looks like half the sugar block is gone , it is more like 2/3 has been consumed, as the half you see is quite thin now. I'll be giving them a second block in about a week, if the temps allow me to get into the nuc for a minute or two. I won't get into it frame per frame, but will check the weight. I salvaged this old stainless unit years ago when they were doing demo at the mess hall at JBLM. Unfortunatly, they have recently changed the size of the big aluminum pans and the new ones are too big The new pans are 1/2" wider. Here you see the few old pans I have that do fit. 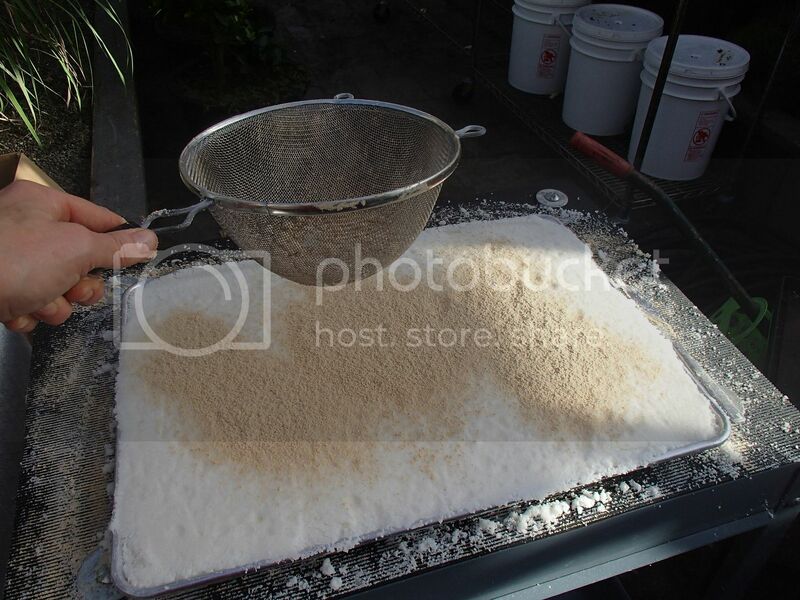 Filled with the sugar block mixture. I was planning to fill this unit with sugar filled pans for drying and organized storage for wintertime use. I guess I'll have to figure something else out. If looking on Craigs list for old pans doesn't pann out, Probably lay a couple 1x2's across for support and use the next size smaller pan. I also had this old hot plate from the second hand store. After cleaning it and making sure it wouldn't catch fire, I'll set it on low and increase the set time since I am behind in the brick making dept. Like most people around the country, my temps are quite cold now and the bees have finally stopped flying long enough to get the bricks made withut them trying to get into my greenhouse. I use to use this hot plate and stainless unit as a smoker, as you can probably see by the smoke stains on the stainless. It worked great! I've had this unit for about 20 years, it's probably at least 50 years old. I love salvaging old stuff. Made in the USA. It all has a history. And a military history at that. 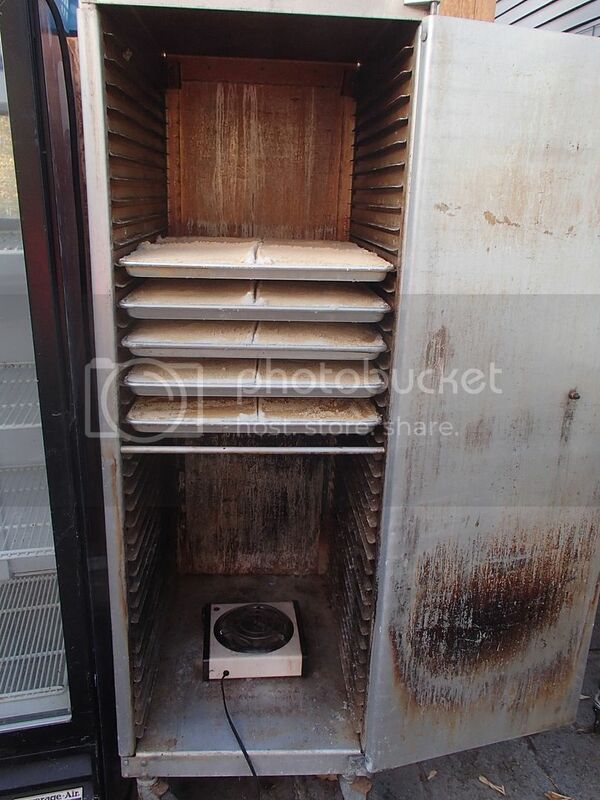 This unit kept meals warm for hungry & tired military personel over the years. It's a small piece of my local history. I also have two pans just sitting out in the greenhouse to dry. I'l let you know how much faster the gently heated ones dry and if it was worth the effort and electricity to do it that way. 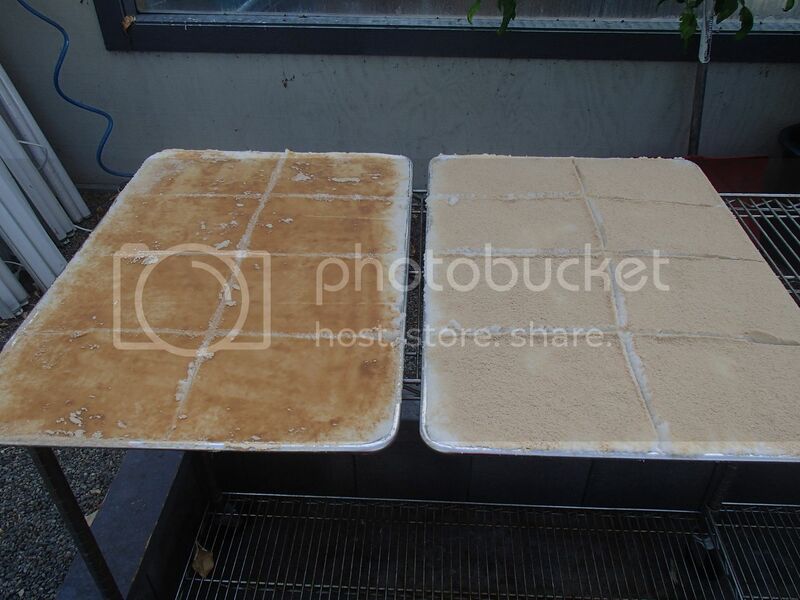 In the photo below, the pan on the left was made an hour ago, the pan on the right was just made. 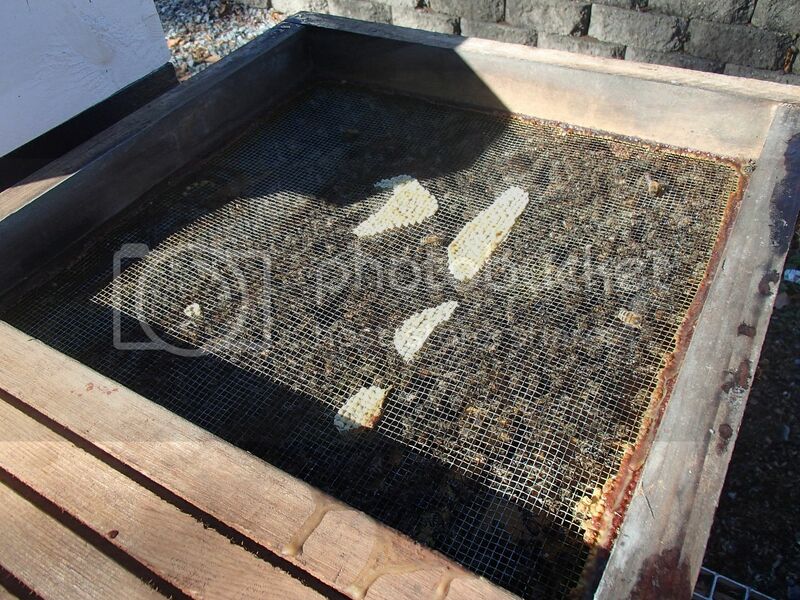 You can see how the left pan has already soaked into the dry beepro. It forms a light crust the bees can ether consume or discard depending on their needs. In my area, I do find the bees appear to consume the protien. I see a difference between colonies that had a plain block in comparison. But my bees generally can get out for cleansing flights at least every couple weeks with only a few longer term tighter clustering conditions. Since I am on time and thorough with late summer/fall feeding, the only hives these bricks go onto are single deeps, most of which are nucs. I'd liketo put them on all the hives since they like them so much, but with so many hives now that would be tough to manage. Last edited by Lauri; 11-12-2014 at 10:01 AM. Don't know if you have tried this or not but i cut 1/2" angle iron the width of the dehydrator. It sits well on the front of the brackets and holds a rack of sugar pans. Just one piece in front seems to do the trick but you could also put one across the back if worried. Mann Lake seems to have various dry protein products. How did you come to choose Bee Pro over the others? I really don´t get the idea of these cakes. Why not feed them full with syrup in autumn? Cheaper, less work. 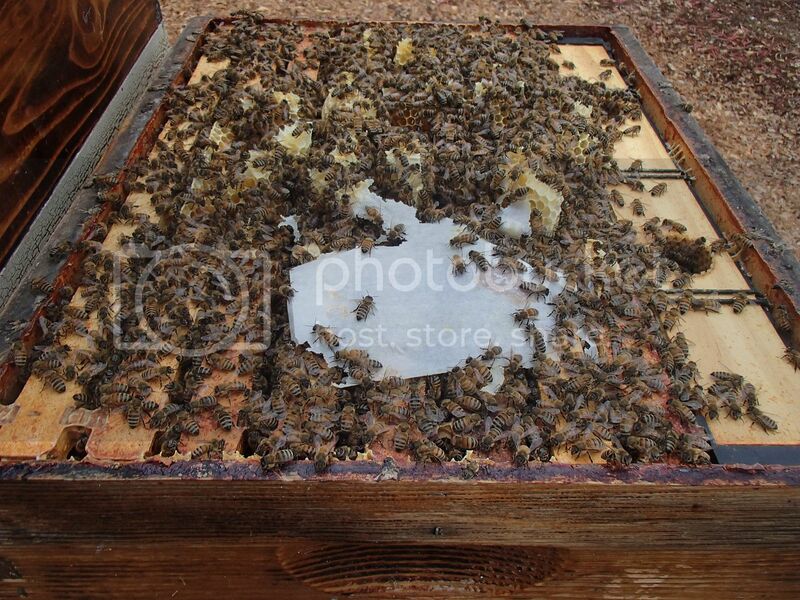 Feeding them in autumn is the normal plan for most all beekeepers, if the hives are light. The idea behind the sugar bricks is simply to give the bees a little extra in case they need it. Sort of an insurance plan. Sometimes even with the most well thought out plan to make sure the bees are ready for the winter some don't do as we like. For those instead of letting them starve, we choose to give them the sugar blocks to get them by. Or at least that's why I do it. Good question and an excellent response. Top work. I do feed in late summer & fall. I'd say 95 % of my hives are more than well prepared for winter. 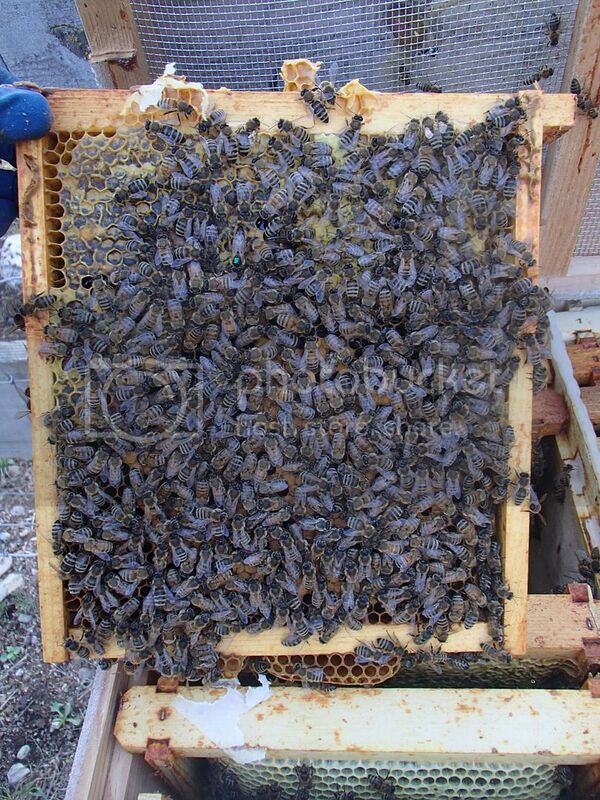 But there are always some hives/nucs that won't quite take up enough feed to put on weight. 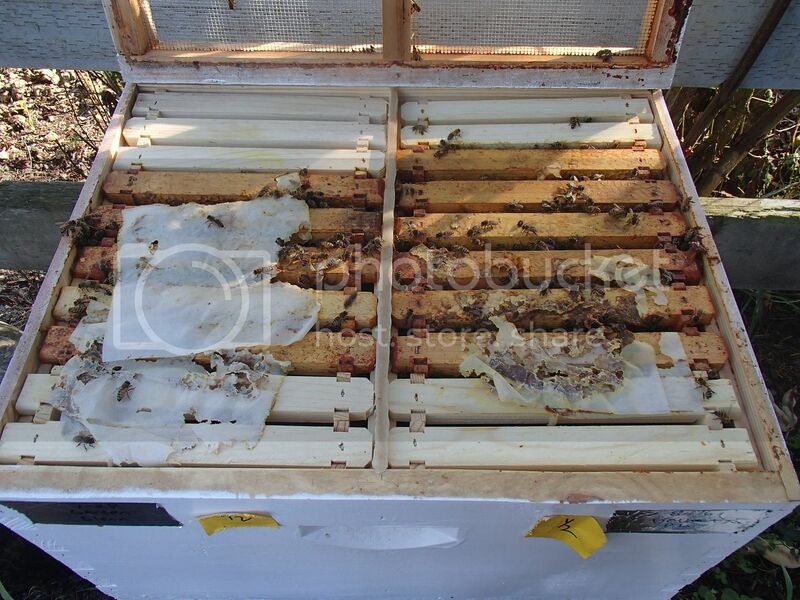 Many times they are the ones with late mated queens in nucs that are still rearing a lot of brood and the drawn combs are already filled with ether brood or feed. There's just no place for them to put more feed and they are not interested in drawing new frames when days get short. 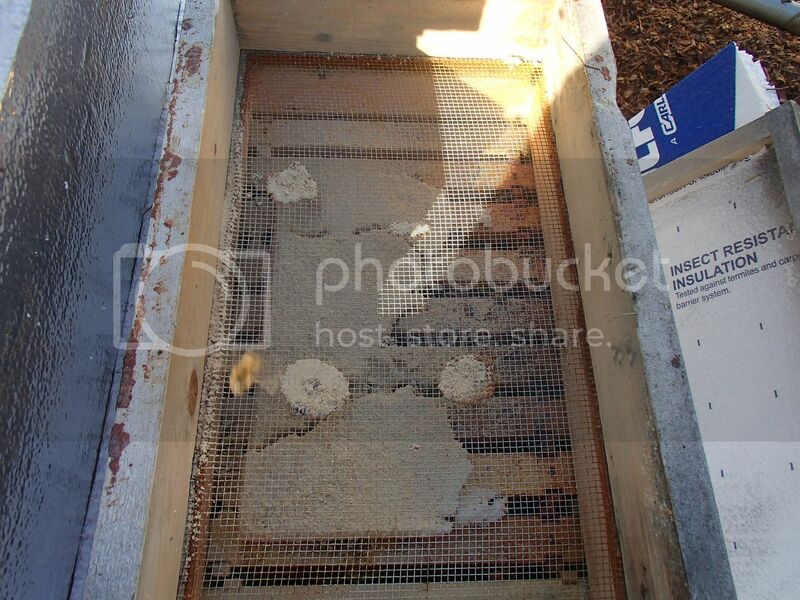 These frames in the center, in the photo below, are all filled, mostly with brood. You can see the papper from patties they've taken up. Although they've been fed syrup, they will only take up so much. There's no way early/late fall to get more weight on them. I've already combined all I want to. WIth a sugar block on top the frames, they overwinter just fine. Otherwise they would likely perrish. I also give my singles (With no feed above the cluster) a block. Even if they are quite heavy, They have easy access to the block and come out of winter in fantastic shape. In fact, it is probably Because I feed late summer to get a good population of young bees for overwintering that these singles need a block. If I didn't feed syrup to stimulate late summer/fall brood, these single would have a smaller population of mixed age bees, and if left with only their own stores might limp along until next spring. They certainly wouldn't come out of winter with the strength I get with my feeding program. Come February/March, the hive below will be black with bees. I leave my feeders in the hive all winter-empty of course. Convenient to have already in place for feeding in the future. I don't have any deadouts to take drawn filled frames from to replace the feeders so they get left in. What I generally do with these is take out the queen and 5 frames in spring and leave the rest with the feeder with a new virgin or capped cell. Then they will use the feeder. Definitely have to give them a bit of a scrape come spring. Syrup is cheaper? How so? Sugar is sugar. All other ingredients are the same as I use in syrup. A little more vinegar, no water, a few drops of essential oils doesn't drive up the cost more than a few cents.. The work is no big deal. 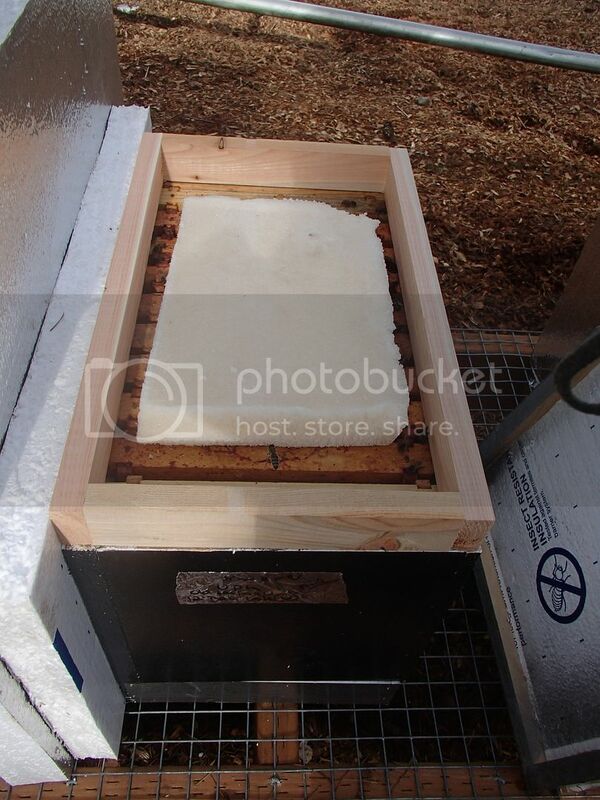 After months of 14 hour work days sweating in my bee suit, I have the luxury of making blocks at my leisure, without my beesuit and without being mauled by hungry bees or yellow jackets. One block generally lasts a colony for a couple months. I don't know about less work. I got up way too early before the sun comes up to mix up late summer/ fall syrup and I spend a lot of time distributing it to the hives. Last edited by Lauri; 11-13-2014 at 08:17 AM. Here is a vitamin and electrolyte supplement I found at tractor supply Co., was wondering if anyone has used it and if its suitable for the girls . If its the right stuff does everyone agree its ok for use in cold climates through the winter with no chance of cleansing flights . I mixed up 16 pounds of these tonight with Heinz real apple cider vinegar with mother (not flavored). Put them in our oven at 170 and what followed nearly cost me marriage. Ok, not that bad, but my wife was NOT happy. They were in for about an hour or so, two of the three pans were pretty wite and firm to the touch, the other was quite wet yet when she finally made me get them out of the house. So they are in the garage now witb a fan on them and the wet one already looks much drier. It will be 13 degrees here tonight... hopefully no ill effects. They are in the garage so, it should stay above freezing. Luckily we have pretty dry winters so they should dry up well. jw - I forgot to mention the aroma didn't I. Sorry! It does put of a very loud aroma while it's in the oven. My wife is very understanding, she and the kids went to grandma's while I was doing ours. When they got back, house smelled like vinegar but went away pretty quickly. lol.. Bees were very happy though!